Osteoarthritis, also called degenerative joint disease, is a chronic condition that causes cartilage deterioration in your joints. The most common form of arthritis, according to MayoClinic.com, osteoarthritis most often affects your hands, neck, hips, lower back and/or knees. While no cure exists, medical treatments, physical therapy and lifestyle changes, such as a healthy diet, may help reduce your symptoms. For best results, seek specified guidance from a qualified professional. Refined carbohydrates, such as enriched flour and sugar, provide calories, but few nutrients to foods. As high-glycemic foods, refined carbohydrate sources can have a damaging impact on your blood sugar levels, appetite, energy and moods. The University of Maryland Medical Center recommends avoiding enriched breads, pasta and snack foods as one useful dietary step toward reducing osteoarthritis symptoms. For best results, check food packaging on breads, cereals, pasta and snack foods, and avoid those that list enriched white or wheat flour or added sugars, such as cane sugar, corn syrup or brown rice syrup as main ingredients. Beverages rich in added sugars include regular soft drinks, sweetened coffee drinks, chocolate milk and fruit punch. Meat and eggs contain saturated fat, which, when consumed in excess, increases your risk for heart disease, certain forms of cancer and obesity. 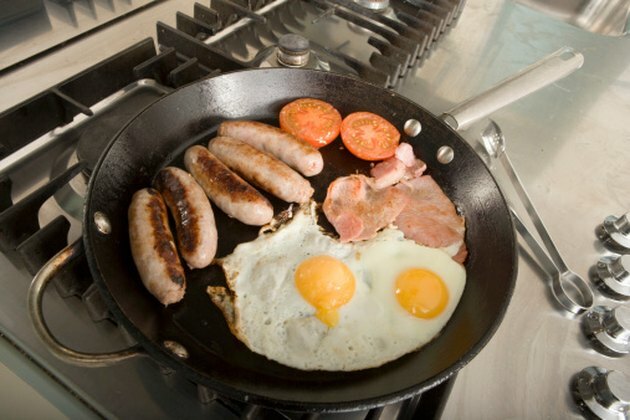 Meat and eggs also contain omega-6 fatty acids. Consuming too many omega-6 fatty acids and too few omega-3 fatty acids, found in fatty fish and flaxseed, may exacerbate arthritic pain and inflammation, according to Arthritis Today. For best results, choose fatty fish, such as salmon and tuna, lean poultry, low-fat dairy products and legumes, over red meat and eggs most often. Since the egg yolks contain the saturated fat and omega-6 fatty acid content, consume the whites only. Trans fats are created through a process in which hydrogen is added to vegetable oil. Trans fats can increase your "bad," or LDL, cholesterol, and increase your "good," or HDL, cholesterol. Trans fats can also lead to inflammation, according to the Harvard School of Public Health. To reduce your trans fat intake, choose whole foods such as fruits and vegetables, over processed snack foods such as crackers, potato chips and pastries. Trans fats are prevalent in shortening, margarine and all foods that list partially hydrogenated vegetable oil as an ingredient. Frozen meals, canned soup, certain brands of peanut butter and numerous fast foods also contain trans fats.